Within the next few weeks a steady shower of human made meteorites - the Iridium family of satellites - will begin to strike the Earth. Bringing satellites back to Earth after their mission is complete is not new. However, bringing an entire constellation of more than 70 satellites back to Earth, years ahead of schedule because of financial failures is new - and unprecedented. In the film "Field of Dreams" an Iowa corn farmer is compelled to build a baseball field amidst otherwise lucrative corn crop. A mysterious voice inside his head says "build it and they will come". He does - and they do. This makes a good Hollywood plot - but makes a horrible business plan. Welcome to the unfulfilled promise of Iridium. Iridium was initially envisaged as a constellation of 77 satellites oriented in 7 planes about the Earth with 7 satellites orbiting in each plane. 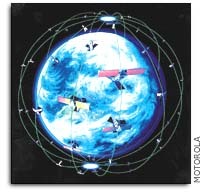 The satellites would cover a set portion of the Earth with coverage overlapping with other satellites providing near continuous and nearly global coverage. It is from the number 77 that the name "Iridium" was chosen - element 77 on the periodic table. It was later decided to scale this constellation back to 66 satellites orbiting in 6 equally spaced orbital planes 421 miles high with 6 spacecraft in each group. Curiously, element number 66 is named "Dysprosium". Motorola decided to stick with the more marketable name "Iridium" even if its applicability to the size of the operational satellite constellation was no longer accurate. Ironically "Dysprosium" is derived from the Greek word "dysprositos" meaning "hard to obtain" - the fate that soon faced Iridium's management. Iridium was launched with the benefit of many who saw global access as a concept whose time had long been predicted - indeed, one that had arrived at last. One could easily follow its core appeal back through the 1960's and Marshall McCluhan's concept of a global village, Star Trek's famous communicators, and even further to Arthur C. Clarke's first concepts of geostationary communications satellites in the 1940's and the ramifications of a world united by universal and affordable telecommunications. It all began in 1987 when the Iridium concept was first envisioned by Motorola. Iridium became a business venture in 1990 and completed its first round of financing in 1993. A second round was completed in 1994. By the time investor funding was capped in 1996 a total of $1.9 billion had been raised. All told the venture would come to cost more than $5 billion. On 1 November 1998, Iridium premiered with formal service starting a few weeks later. Iridium seemed poised to be first out of the gate with other ventures still being organized and years behind Iridium. Problems began almost at once and snowballed quickly thereafter. Iridium phones were late to ship, didn't work inside buildings or out of direct line of sight with a satellite, and cost far too much ($3,000). Call rates could easily reach $7 per minute. The phones were heavy and had very limited usage beyond basic telephony and were simply not designed to handle the demand for ubiquitous Internet access - something that was not a factor in the late 1980's and early 1990's when Iridium was being designed. Other ventures, now nipping at Iridium's heels sought to provide these services - and would do so coupled with explosively popular ground-based cellular phone systems - another factor Iridium did not have the foresight to consider. Had Iridium appeared in the very early 1990's it might have had a better chance at success. Instead it arrived in the midst of a revolution no one foresaw barely a few years earlier - one able to run circles around Iridium's already stale technology. The speed of Iridium's demise surprised many - especially given its solitary presence in the space-based telephone market. Iridium initially sought to play up the marvels of this access by a number of highly visible promotional ventures. One was Iridium Icetrek an Antarctic expedition where the son of Everest climber Sir Edmund Hillary and a small team took and overland route by skis from Scott Base to the South Pole in January 1999. They were airlifted out after successfully reaching their destination - giving live interviews via their Iridium phone all the while. Alas, little more than a year later in June 1999, Iridium's fortunes had faded such that another expedition - this one crossing the arctic icepack and relying upon Iridium phones - almost lost their service when Iridium began to shut down. A special service for expeditions such as the one in the arctic was established at the last minute. Meanwhile, all other Iridium phones on Earth were going silent. Instead of becoming the global telecommunications preferred choice for users around the world, Iridium became as much a high tech toy for the rich and famous as it did a lesson in bad market research. By August 1999 Iridium declared bankruptcy. Given the amount of money invested and the looming failure that lay ahead, many financial publications and analysts referred to its failure as one of the largest and most significant in recent history. A number of rescue attempts surfaced. The one given the most credence was that proposed by billionaire Craig McCaw which involved a purchase of the company for $6 billion. That offer was later withdrawn when it became clear that the purchase would not make economic sense. NASA even turned down a chance to take over the network citing no clear use to which they system could be put. The end is now abundantly near: another offer surfaced this summer offering a scant $30 million for the entire suite of ground and space-based assets - a capability worth more than $5 billion just a few years back. The concept of a global telecommunications capability for consumers is not dead by any means. Despite Iridium's seemingly inevitable demise, one time Iridium White Knight Craig McCaw (with backing from Microsoft's Bill Gates) is building the $10 billion Teledesic system. Teledesic is scheduled to debut in 2005 and will use a swarm of 288 satellites to deliver high-speed video, data and telephone to anyone, anywhere on Earth. Teledesic is a true product of the Internet and wireless age and seeks to embrace and build upon this technology whereas Iridium was not designed - or able - to do so. The Iridium satellites were initially launched by a combination of Boeing's Delta, Russia's Proton, and China's Long March launch vehicles. The first launch occurred in September 1997. The operational constellation was completed a year later. Deorbiting the Iridium fleet is now set to begin in the next few weeks and could cost $50 million or more to complete. In addition to the operational satellites (72 operational satellites were launched) a number of test, decommissioned, dead, or spare satellites were lofted bringing the total fleet to 88 - all of which need to be brought back to Earth in a controlled fashion. One of the unexpected benefits of the Iridium project was catching "Iridium Flares". Each Iridium satellite has two Main Mission Antennas, long silver-coated teflon structures oriented 40 degrees from the axis of the satellite. As the satellite passes overhead and passes into the right configuration with respect to the sun and a viewer on the ground, a brief bright flash of light occurs. These flashes ("flares") last only a few seconds but can be brighter than the planet Venus. The prediction and observation of these flares has become a rather popular sport for amateur astronomers with a number of websites dedicated to published tables and instructions. It is ironic that the only lasting visible legacy of Iridium over the next few years will be to serve as flashes in the sky as they orbit overhead and then crash back to Earth. Teledesic is due to debut in 2005 and has set some rather lofty goals for itself: "On Day One of service, Teledesic will enable broadband connectivity for businesses, schools and individuals everywhere on the planet. The Teledesic Network will accelerate the spread of knowledge throughout the world and facilitate improvements in education, health care and other crucial global issues." This is eerily similar to some of the things Iridium had to say about itself on the eve of its launch. Teledesic is by no means the only service under development - check out Wired Magazine's 1998 list of who's who (Space Jam). It will be just as crowded overhead - if not more so - in the years to come. We all want to have a communicator like Captain Kirk had so we can call talk to anyone anywhere on this planet - at anytime. The real challenge is for the private sector to meet our demand - and adapt to it as our demand changes. Imposing a solution that doesn't meet actual demand (or the imminent prospect thereof) is doomed to failure. As far as Iridium is concerned, the rocket science worked like a charm - its the underlying economics that failed. � Iridium, Lloyd's Satellite Constellations - an excellent collection of the operational and business aspects of the Iridium project.